Sanctuary Cove Estates is a riverside development on the prime southeast quadrant of U.S. 301 and 6th Street East in Palmetto. 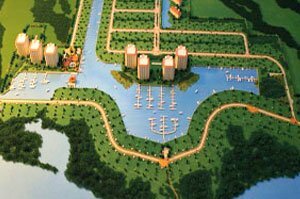 It occupies 211 acres which abut the campus of Feld Entertainment to the east and the Manatee River towards south. WCI Communities is building the first residences in this property where the original plans set in 2005 aimed for the construction of 950‒1,100 residences, including condo units in a 12-story riverfront building, four-story townhouses, and 266 single-family homes. The planned development also included 200,000 square feet of commercial space on the property’s U.S. 301 frontage. However, the entire project, estimated to cost $1 billion, was mothballed because of the Great Recession. Development work in the property was revived in 2017, and in the fourth quarter of the year, WCI bought 56 lots at Sanctuary Cove for starters. This Bonita Springs-based builder, now under the banner of top U.S. builder Lennar Corp., said it will be building on a total 176 home sites, including 66 lots on the riverfront. Quite apt to its location, Sanctuary Cove homes for sale feature coastal-themed exteriors. Prospective buyers in this community can choose from nine WCI floor plans at prices between the $300s and the $700s. This builder showcased two of these designs in the 2018 Sarasota Manatee Parade of Homes. One of these models, the Boretto, was adjudged best overall in its category in this annual showcase and was also cited as best in architectural detail, master suite and kitchen. This residence comes with a floor area of 2,644 square feet, designed with four bedrooms including a luxurious master suite with a Jack and Jill bathroom and a spacious walk-in closet. Its award-winning kitchen is a chef’s delight with its GE® stainless steel appliances, double-wall oven, gas cooktop, and quartz countertops. The pricing of this one-story home starts from the upper $400s. WCI also entered in the annual Sarasota‒Manatee home showcase its San Remo model, a 2,250-square-foot residence priced starting from the high $300s. It features a spacious master suite plus two additional bedrooms and a flex space which can be converted into guest room. This home design and the Boretto have a two-car garage, and a separate garage for golf carts are also provided in the larger floor plans. One of the larger options that prospective buyers of Palmetto homes for sale can check out is WCI’s two-story Asti. It has a floor plan measuring 2,725 square feet and features three bedrooms, four baths and a half bath. 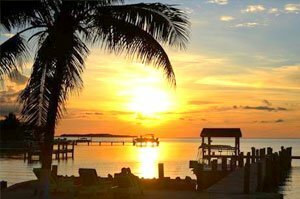 Buyers with lesser requirements, on the other hand, can consider WCI’s Grand Cayman offered at Sanctuary Cove. This ranch-style home features three bedrooms, two baths and a half-bath within a floor area of 1,962 square feet. Sanctuary Cove’s amenities all but naturally include a community marina with 210 boat slips plus six boat lifts. Future residents can also expect other perks of living in this development, such as 24-hour security, a resort-style swimming pool, and an 8,600-square-foot clubhouse. The perks it offer include a game room, fitness center, Internet café, event space and, of course, scenic harbor views. Sanctuary Cove likewise provides a beach area for its homeowners. Additionally, its residents are only a short drive away from world-class Gulf beaches like those in Anna Maria Island. Siesta Key and its pristine white sands aren’t too far either. This community is also conveniently located near several parks and nature preserves, as well as popular shopping and dining venues not only in Palmetto but also in Bradenton. 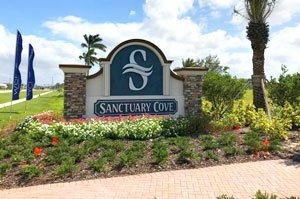 Below are the current real estate listings available at Sanctuary Cove.